Get Your Hands On This Premium Quality Child Leash Brought To You By Eco-Baby Today! 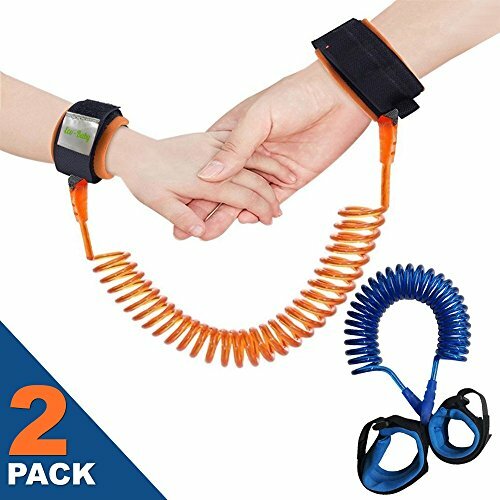 Are you looking for a sturdy, strong wristband link to keep your toddler under your supervision when you are in a crowded place? Have you tried similar products in the past, but ended up being disappointed because they were flimsy and poorly constructed? Would you like to try a dependable, premium quality, super comfortable kids' leash that won't cost you a fortune? If your answer is yes, then look no further; Eco-Baby has just the thing you're looking for! High-Quality Deluxe Wrist Link; A Freedom Gift For Parents & Children! Specially designed in order to satisfy even the most demanding parent, our child wrist leash has a variety of exquisite features that make your best safety choice! There are a lot more, but you get the idea! You are simply going to love it - and so will your child, since it will boost their confidence and give them the chance to explore their environment and surroundings! In such a wide and demanding market as child care products, your customers' loyalty and satisfaction are the things that keep you going! We at Eco-baby consider your happiness our number one priority; which is why we use environmentally friendly and skin friendly fabrics, our products undergo strict quality controls to ensure our rate defect is UNDER 1%, AND we have the best customer support team that will assist you 24/7! So, What's Taking You So Long? Just Place Your Order Now & Enjoy Your Carefree Walks With Your Child!  FREEDOM FOR YOUR CHILD, SAFETY FOR YOU! When you are in packed, crowded places like a Super Market or a park with your child, our exquisite wrist link guarantees that your child can roam around freely, but also safely!  SOFT FABRIC & COMFORTABLE DESIGN! The double-layered Velcro is soft, yet firm around your kid's hand. The wrist strap is easily adjustable, and the wrist sponge pad ensures maximum comfort for both you and your child!  IMPECCABLE CONSTRUCTION QUALITY! We at Eco-Baby make a point of using nothing but the best quality PU and stainless steel for our kids wristband leashes, along with modern production processes and extremely strict quality control, in order to be certain that they will last you many years of use!  AN IDEAL GIFT FOR ANY PARENT! Whether for new parents on the block or for field veterans, our premium quality children leash is the ultimate present idea; it is thoughtful, super practical, and easy to use! Any parent will appreciate it - and love you for it!  PURCHASE WITHOUT ANY RISK! We are confident that our toddler wrist link is the best safety product your money can buy. In fact, we are so confident that, in case you aren't totally satisfied with your purchase we offer you a hassle-free, 30-day money back guarantee! If you have any questions about this product by Ecobaby, contact us by completing and submitting the form below. If you are looking for a specif part number, please include it with your message.